Eating less unhealthy fats (trans fat, saturated fat and cholesterol) and by choosing the types of fats that help your cholesterol levels (unsaturated fats). Maintaining a healthy weight by keeping portions in perspective and making healthy food choices. Reducing your sodium intake, which can help many people with blood pressure control. The ingredients you use and the way you cook can make a big difference. Below are some practical tips to remember for heart-healthy eating and cooking. Choose the Right Fats – In Moderation! This means limiting foods high in trans fat, saturated fat and cholesterol – like processed snacks and sweets, baked goods, fried foods, high-fat dairy products, solid fats, and high-fat meats. Instead, choose lean protein foods and low-fat dairy products. Limit the amount of processed snacks and baked goods you buy and eat. Choose more nutritious fresh foods to include in your snacks and meals such as fresh vegetables, whole grains, nuts and fruit. When cooking, skip the butter and margarine and try healthy vegetable-based oils in moderation. Read more about which foods contain healthy and unhealthy fats on our Fats page. Omega-3 fatty acids are a type of healthy fat that helps prevent the clogging of arteries. We recommend including fish (non-fried) in your meal plan at least twice a week – especially those high in omega-3 fatty acids. These "fatty" fish include salmon, albacore tuna, herring, rainbow trout, mackerel and sardines. Other foods that provide omega-3 fatty acids include soybean products, walnuts, flaxseed and canola oil. It's also great if you can include some of these sources in your diet. Try mixing walnuts into your morning oatmeal or adding tofu to your stir-fry. You can cut down on the calories in your meals by broiling, microwaving, baking, roasting, steaming or grilling foods. Avoid frying foods in lots of oil, lard or butter. It is okay to use some fat when cooking. Just make sure you use oil high in unsaturated fats and don't use too much. (Remember that all fats are dense in calories, so they will add up quickly.) Some ideas are olive, peanut, corn, vegetable, safflower, sunflower or flaxseed oil. Nonstick pans and cooking sprays also work well if you're trying to reduce calories in a dish. Homemade and Fresh Is Best! Restaurant food tends to be high in calories, sodium, and unhealthy fats – all things you want to watch if you're eating heart healthy. Try to cook at home as much as possible with fresh, healthy ingredients. You'll find that you have much more control over what goes into your food. If you are looking for diabetes-friendly recipes to make at home, sign up for Recipes for Healthy Living. 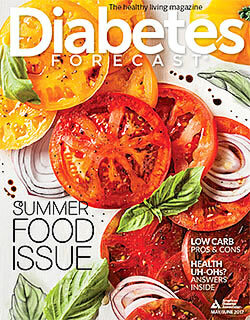 You'll receive with dozens of meal ideas, healthy tips and recipes each month. Squeeze fresh lemon juice or lime juice on steamed vegetables, broiled fish, rice, salads or pasta. Try salt-free lemon pepper or mesquite seasoning on chicken. Try a salt-free herbs and spices. Fresh herbs are also a great choice. Use onion and garlic to liven up meats and vegetables. Try marinating and grilling chicken or pork with barbecue sauce or with a homemade marinade. Cut away visible fat from meat and poultry. Roast food on a rack to let the fat drip off. Make soups a day ahead so you can chill them and then remove the fat that has risen to the top. Try 90% lean ground beef or better yet, try lean ground turkey breast. Why? Fewer calories, less saturated fat and less cholesterol. Try non-fat plain yogurt (regular or Greek). Why? Fewer calories and less saturated fat. Try trans-free margarine and oils like olive oil or vegetable oil. Why? No trans fat, less saturated fat and more heart-healthy unsaturated fats. Try substituting half with applesauce. Try 1% milk or skim milk. Try reduced-fat cheese or use less. Try fruit with plain yogurt, fresh vegetables and hummus, a slice of whole wheat toast and natural peanut butter, nuts and dried fruit. Why? Less sodium, less saturated fat and zero trans fat. Try light mayonnaise or mustard on sandwiches. Try non-fat plain yogurt or a combination of non-fat plain yogurt and light mayonnaise if used in dressing, sauces and dips. Try sliced low-sodium turkey or roast beef. Or better yet, cook fresh chicken or turkey on the weekend and use throughout the week for meals. Why? Less total fat, less saturated fat and less sodium. This two-page introduction to heart-healthy foods is in PDF format so you can download it, print it, and hand it out to patients.